Heat oven to 350°F. 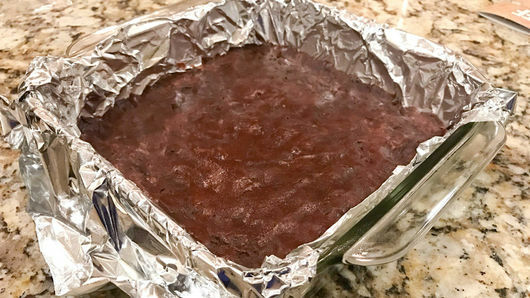 Line bottom and sides of 8-inch square pan with foil. Let 1 roll (16.5 oz) Pillsbury™ refrigerated chocolate chip cookies stand at room temperature 10 minutes. 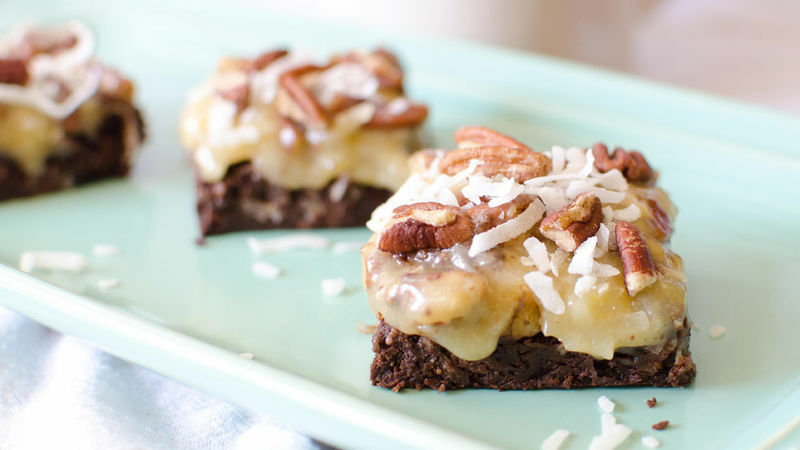 In medium bowl, mix cookie dough and 1/3 cup unsweetened baking cocoa until well blended. Press evenly in bottom of pan. Bake 12 to 15 minutes or until edges are set (do not overbake). Cool completely, at least 1 hour. 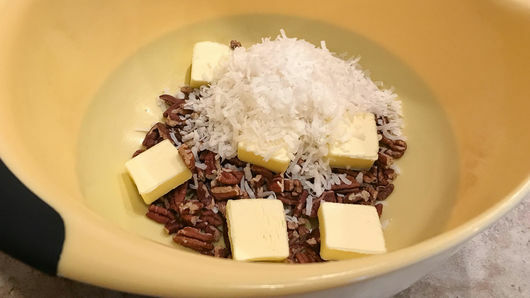 In large bowl, mix 3 tablespoons unsalted butter, 1/4 teaspoon salt, 3/4 cup toasted pecans, roughly chopped, and 3/4 cup sweetened or unsweetened coconut flakes. Set aside. In 2-quart saucepan, cook 1/2 cup heavy whipping cream, 1/2 cup sugar and 2 egg yolks over medium heat 3 to 5 minutes, stirring frequently with heatproof spatula, until thickened and mixture coats back of spatula. Immediately pour into bowl of coconut/pecan mixture. Stir until butter is melted. Let cool to room temperature, about 1 hour. Mixture will thicken into icing as it cools. Spread icing over chocolate cookie layer. Refrigerate until set, about 1 hour, before cutting into bars (4 rows by 4 rows). Bake cookie layer the night before so it’s cooled and ready for the icing the next day. Toss the spoon, and use your hands to mix the cookie dough and baking cocoa.